In terms of medical robots, can you share some of the biggest breakthroughs in the medical world that robots have “lent a hand” in? The first FDA approved medical robot was Zeuss from Computer Motion Inc. This early robot pioneered a field which was later dominated by the most successful commercial surgical robot, da Vinci from Intuitive Surgical Inc. Both systems provide surgeons with very high dexterity with very small (~ 1cm) incisions in the patient. Surgeons can convert an operation which previously required a large incision to such a minimally invasive approach. This makes the recovery much quicker and less painful for the patient. The specific procedures which have realized this benefit are the radical prostatectomy (removal of prostate gland) and hysterectomy. Robotic surgery has treated over 3 million patients today. An exciting possibility opened up by surgical robots is remote surgery allowing access to specialized care for people in remote locations. This was pioneered by Dr. Jaques Marescaux of Strassburg France in 2001 when he used the Zeuss system to remove a gall bladder on a patient in France while controlling the robot from New York city. Dr. M. Anvari of Toronto later did this clinically with dozens of patients in northern Canada from his hospital in Toronto. When Computer Motion was acquired by Intuitive, this was no longer possible because the da Vinci, as built, cannot be used for remote surgery. Will there ever be a time where robots conduct surgeries unaccompanied, outside of human intervention or supervision? If so, how far away are we from that point, and if not, please explain why we won’t get there in the foreseeable future? The extreme scenario is not envisioned by any engineers or surgeons today. There is a lot of human skill in surgery which is still poorly modeled and understood. Researchers today are experimenting with partial autonomy which could provide AI functions to assist a human surgeon. When these are perfected, the skilled surgeon is still required. For example, we still will need a human to make sure that the specific conditions of this patient are appropriate for the algorithm to be used. An interesting application which might drive more full autonomy in robotic surgery is care of astronauts on a Mars mission. Time delays at the speed of light to Mars are around 20 minutes. There is no reasonable way to teleoperate surgery with 20 min of time delay. If an astronaut were to require surgery on Mars, and assuming no surgeon was available there, a robotic system, carefully programed and tuned by earth-based surgeons, would have to do the whole procedure or large parts of it autonomously. Realistic simulations, based on the astronauts pre-operative imaging, and detailed models of human tissue, could be used to validate the procedure before starting. Does the financial aspect of surgical robots make sense at the current time or are we still needing economy of scale to make the numbers work for hospitals? Surgical robotic systems are still very expensive ($1.5-2M) and the per-procedure consumable supplies are also expensive. Intuitive has enjoyed substantial patent protection as their reward for pioneering the business, but there are several major companies publicly developing future competitive systems. These are expected to significantly lower prices and expand accessibility. How do robots impact human performance, and what types of people in what industries will be most affected? In the 19th century, steam power, electric motors, and internal combustion engines eliminated almost all jobs in which humans provided motive power with their bodies (and there were a lot of them). It turns out people had many other ways to add value. In the 20th century, computers eliminated many jobs which required humans to read, sort, file, transcribe, add up columns of numbers, and similar clerical tasks. In the 21st century we expect robots will eliminate jobs which consist of basic manipulation tasks (bin picking, assembly, material handling, welding etc.) as well as vehicle driving. I suspect people will similarly adapt and add value through creativity, design, personal service, etc. Are there any unusual applications for robotics that haven’t been introduced or talked about yet? Are the possibilities limitless or is there a ceiling on how far robotics can go? We need a new Asimov to answer these questions. His work is still relevant, but needs to be re-imagined in the post-information explosion world. Can you share some of the projects you’re working on at the Biorobotics Laboratory, specifically the ones that your students gravitate towards to the most and how they will transfer their learning to real-world use? 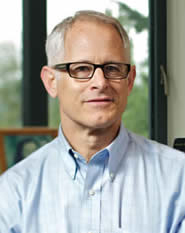 Blake Hannaford is an IEEE Fellow and the director of the Biorobotics Laboratory at the University of Washington. Blake received a B.S. degree in Engineering and Applied Science from Yale University in 1977, and a M.S. and Ph.D. degrees in Electrical Engineering from the University of California, Berkeley, in 1982 and 1985 respectively. His currently active interests include haptic displays on the internet, surgical biomechanics, and biologically based design of robot manipulators.